The senior-level energy lawyer is living proof that it is possible to achieve balance between career ambitions and adventure pursuits. It’s a formula that Valentine, now 56 and a senior partner at the global law firm Norton Rose Fulbright, lives by. A specialist in oil-and-gas law, Valentine has been known to log between 200,000 and 250,000 kilometres of air travel in a single year – Mozambique, Australia, Siberia, Brazil and Angola were all landing spots in recent years. His work schedule suggests someone too busy lawyering for anything else; Monday to Friday, he arrives at the office by 7:15 a.m., with his days often extending into evening meetings. Even so, Valentine is almost always coming home from, or heading off on, another sport-related adventure. Sometimes his trips are simple and close by, like his regular excursions to Kananaskis Country. But often, they are far-flung – and sometimes far-fetched, as well. 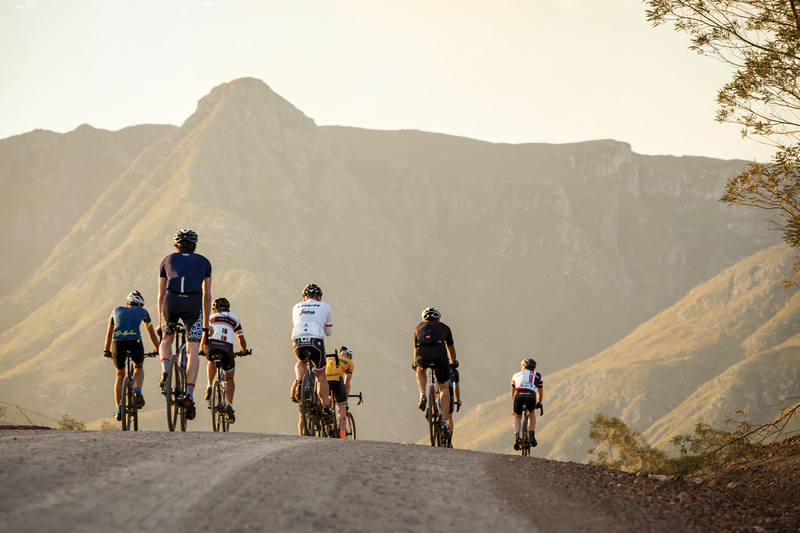 Gravel-road cycling in South Africa. Photograph by Nick Muzik. Valentine doesn’t train specifically for his various trips but tries to maintain a “high-enough” level of fitness to be ready for anything. In Calgary he does spin training two or three times a week at Peloton Cycling and takes trainer Pete Estabrooks’ TKO boxing class over the lunch hour. On weekends, Valentine often heads to the mountains to snowshoe in the winter and cycle or mountain climb in the summer. 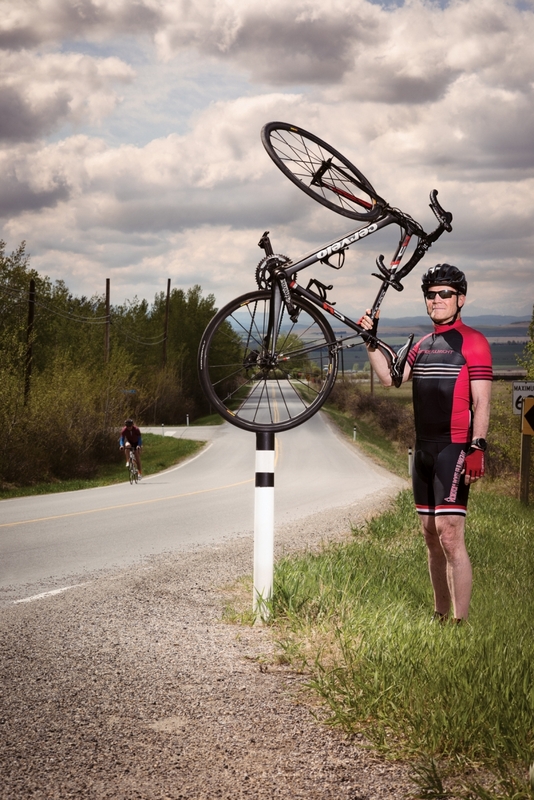 He used to run, completing two marathons a year for more than a decade, but turned his focus to cycling when his knees began to hurt. As far as his diet, Valentine eats healthily – most of the time. His wife and three adult daughters are vegan and he adheres to their plant-based diet at home, but indulges his carnivorous tendencies when he dines out. His favourite breakfast of a Red Bull and PowerBar certainly does not qualify as healthy by any measure, but he swears it helps with jet lag. “That’s one of my ‘sins,'” he says. But the man didn’t lose his card and instead Valentine found himself headed for London. He showed up with an $800 aluminum-frame bike and 20-year-old cycling shoes on his feet. (The race crew promptly sent him away to buy modern cycling footwear.) On the first morning of riding, he fell off his bike and ended up vomiting at the roadside from the effort. As it turned out, the man he’d been encouraging was none other than Stephen Roche, one of the most celebrated cyclists in the history of professional racing. Retelling the story elicits a self-deprecating chuckle, but the embarrassment didn’t keep Valentine from becoming hooked and he has since returned to the London-Paris ride almost every year since 2012, bringing along a growing cadre of friends, colleagues and usually a few people he barely knows, but has convinced to join him, nonetheless. 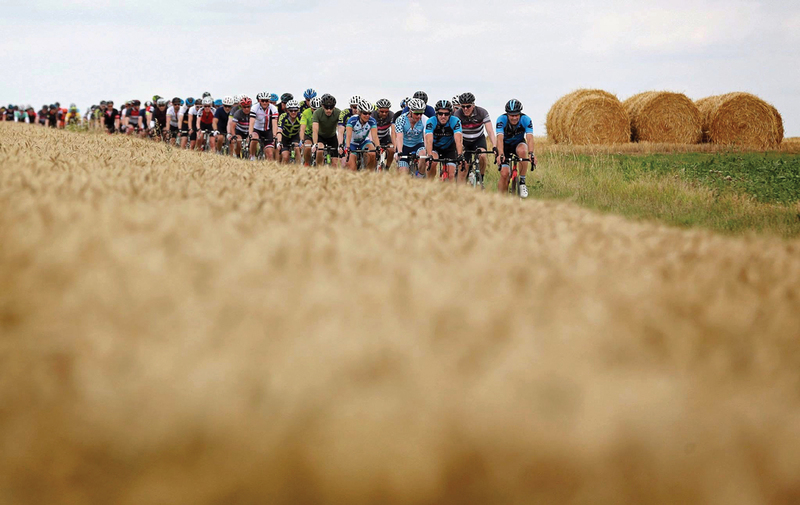 London to Paris ride, 2017. Photograph by Matt Alexander Photography. Valentine describes himself as never having been a star athlete, but rather someone who always loved the social side of sport. That’s still the draw today, he says. He believes there’s something about suffering through sport that encourages men, in particular, to open up in ways they otherwise would not. It’s something Valentine feels even more strongly about since his friend George Gosbee, the Calgary businessman who founded AltaCorp Capital and Tristone Capital Global Inc., took his own life last fall, just weeks before a climbing trip to Argentina the two men had planned to do together. “It broke my heart. It still bothers me; it always will,” says Valentine. He can’t say whether it would have changed anything for Gosbee in the end, though he’ll always wish they could have done that trip. For now, Valentine has no plans to let up on his work or his adventures. He’s happiest doing a bit of everything, rather than dedicating his time to one thing. “That, I think, is the secret to success,” he says. 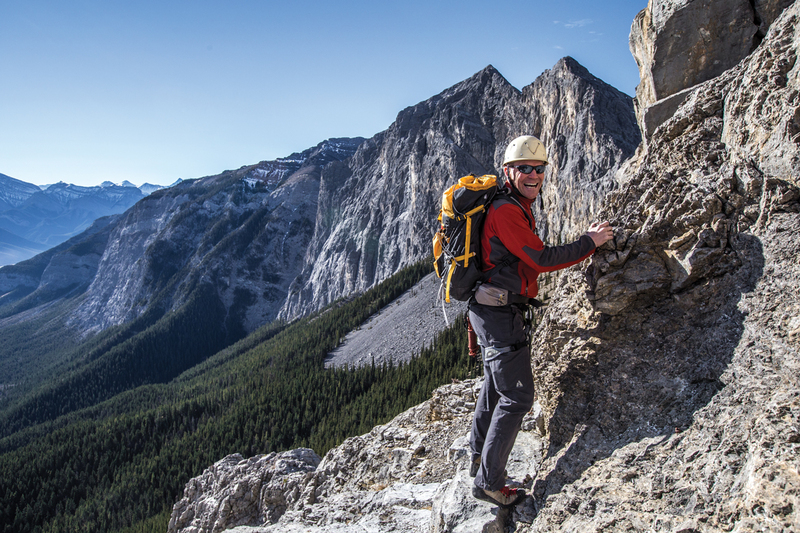 Rock-climbing on Mount Yamnuska in Kananaskis Country. Photograph by John Price.